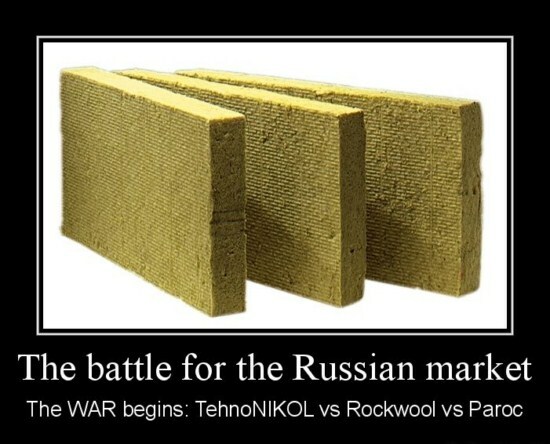 Russian manufacturer of roofing, waterproofing and insulating materials corporation «TechnoNikol» plans to build a plant in Rostov region for the production of stone wool capacity of 50 tons per year. The enterprise value of at least $ 45 million will be built in two years. His power will «TechnoNikol» get up to 45% of market insulation SFD, say proponents of the project. According to experts, taking into account the growth in construction in the SFD and the absence of big players in the region, the company has a chance to win sizeable proportion of the southern market. «Plant for the production of rock (or mineral) wool corporation» TechnoNikol «will appear near Rostov-on-Don, Krasnosulinskom industrial park. The company will install a production line with capacity of 50 tons of insulation per year «- said the» Y «director of sales trends,» Stone wool «corporation Roman Kolesnikov. The project is planned to invest about $ 45 million equity. Now the investor completes the estimate of the cost to connect the selected plot to communications. Design work will begin in six months, to pass an object into operation «TechnoNikol» going in the first half of 2014. The expected payback period — 10 years. «We’re with the company begin the process of registration of land covering about 25 hectares,» — said the executive director of the Investment Promotion Agency of Rostov Region, the project maintainer, Igor Burakov. According to him, while we are talking about the production of stone wool insulation, but later lineup of products of «TechnoNikol» in the Rostov region, can be expanded. Roman Kolesnikov told, the plant’s products will be delivered to the markets of South Federal District, the North Caucasus, to a lesser extent, in southern Kazakhstan, Armenia, Georgia and Azerbaijan. «Now, in the south of Russia there is no current production of heat-insulating materials based on mineral wool, so we decided to create our own factory here,» — said Mr. Kolesnikov. With the launch of a new plant fraction «TechnoNikol ‘SFD on the market, according to the company, may reach 40-45%. According to marketing agency Discovery Research Group Russian market for insulation materials (TIM) is 25 million cubic meters. meters in volume and about 30 billion rubles. — In cash. The growth of the market in 2011 amounted to about 10% in 2012 — TIM will grow at the same rate. Corporation «TechnoNikol» (Moscow) — a manufacturer and supplier of roofing, waterproofing and insulating materials. Founded in 1993. Owns 35 production sites in Russia, Ukraine, Belarus, Lithuania and the Czech Republic, its own distribution network of 180 branches and representative offices in 35 countries. The annual turnover of more than 35 billion rubles., 25% of products are sold for export. The representative of the southern company, which produces sandwich panels, rock wool will be in demand in the construction sector of the Southern Federal District — from housing and shopping centers to low-rise building. «The construction market in southern Russia is now demonstrating a good momentum of growth. If Moscow, St. Petersburg and other regions of the middle band passed its peak in 2007-2008, in the south are still a lot of build. Therefore, the choice of the southern region to create the production of thermal insulating materials is justified. It is possible that «TechnoNikol», including counts and low-rise building, whose share in the SFD is large enough, «- says CEO Ivan INFOline news agency Fedyakov. The stated capacity of the plant «TechnoNikol» he says little. «This venture with a production capacity of slightly above average» — said the expert. The only significant competitor in the south of Moscow corporation analysts believe Rostov JSC «Komat» with the capacity of the production line at 15.4 tons per year. Mr. Fedyakov notes that the major players of Russian market of insulation materials are of «Saint-Gobain Isover», URSA, Rockwool, Knauf, «TechnoNikol», Paroc and «Penoplex.» «Prior to 2009 the share of each player can be easily calculated, because all products were sold companies and their factories were operating at full capacity. After the crisis, the volume of construction slumped, the market surplus arose insulation. I think in 2012 it is already possible to estimate the volume of the market and the proportion of players, «- says Mr. Fedyakov.